Did you know? Assassin’s Creed Unity protagonist Arno is named after the noise you make when you trigger the wrong contextual action and send your robed killer hurtling off a church spire and into a courtyard full of imperialists. There’s none of that going on in Ubisoft’s GamesCom demo. Instead, a series of vignettes revealing the texture of Parisian life that we’ll be pushing, shoving and shanking our way through. There’s a quick preview of Arno’s new moveset in there, too. The Gallic assassin hurls himself along the side of buildings with what reads like overconfidence. What’s more, he can clamber down the sides of cathedrals, rather than suffer the inconvenience of finding a bale of hay and nearby eagle to soundtrack the jump. 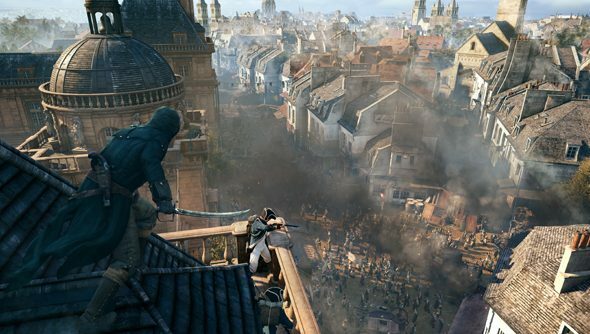 Did you see the last Assassin’s Creed Unity trailer? That was more about CG melodrama than the background stories of the city.